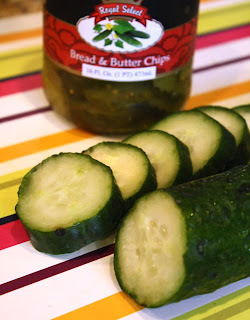 Instead of swigging sour, or sweet bread and butter pickle juice, or dumping it down the drain, just add some fresh chopped cucumber and make the crunchiest pickle you will ever bite into. Waste not want not -- reuse that juice! When I buy these hot-house cucumbers, they are so huge a salad cannot contain one. 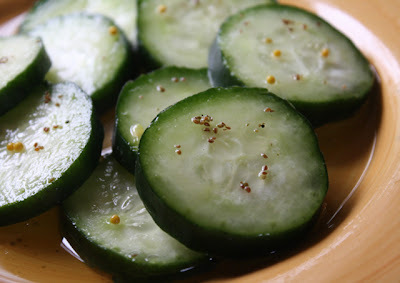 If you have a jar of pickle juice left over, just slice that leftover cucumber and let it soak overnight. These fresh tasting pickles will not last as long as regular ones, but they should last a week longer than normal, and maybe even into the following week. The taste is light and fresh.They are even good on a burger, or as just a snack or side. They will not be as sour or sweet as you are used to, but you will not make such a sour face when you take a bite. Slice fresh cucumber about 1/4 inch thin. Add to leftover pickle juice, either sour, or sweet bread and butter. Allow to soak overnight in the refrigerator. Will last a week or two stored in the fridge. Good anytime and quick too! This is a go-to recipe for a light, meaty chili in a hurry. 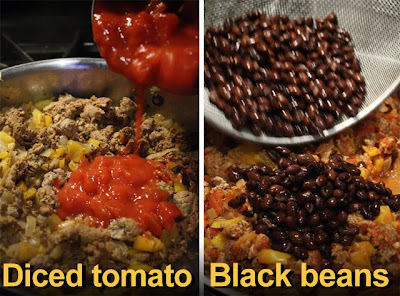 A drained can of black beans, canned chopped tomato, and a pound of ground turkey, along with one onion, bell pepper, garlic and chili powder, is all you need. I buy frozen one pound tubes of turkey for about a dollar a pound in the frozen deli case -- a defrosted package of ground turkey in the meat department is much more expensive (costing more than ground beef), but the flavor is not different enough for the extra expense, at least to this chintzy chef. Cans of black beans (or pinto/red) and chopped tomato are ready to heat up and cheap at any grocery. Onions and garlic are the other budget ingredients; I used yellow bell pepper, but green is a cheaper substitute. 1 lb. 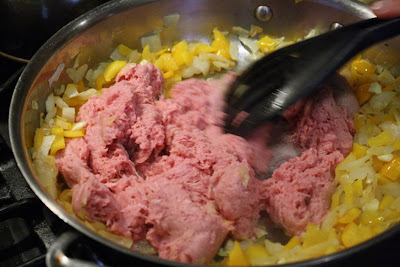 ground turkey, defrosted - I use pre-frozen tubes from the frozen case, as it is cheaper. 15 oz. can of black beans - OK to substitute pinto or red beans. Drain out liquid. 15 oz. can of chopped, diced or crushed tomato (or fire-roasted, for extra flavor). 1 whole onion - chopped. 1 whole bell pepper - chopped -- OK to use red, yellow or green bell pepper. 1 tbsp. chopped garlic - fresh or from the jar. 1 tsp. 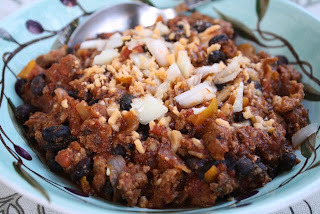 of chili power - add an extra tsp., for an extra flavorful chili. Saute chopped onion, bell pepper and garlic for 5 minutes, or until soft. Add turkey, chili powder, ground cumin and cook until done, 5-10 minutes. As turkey cooks break it apart into small to medium chunks. Pour in can of chopped tomato and drained black beans. Bring to a simmer, reduce heat to low, and cook covered for 20-30 minutes. I like to serve my chili with a little chopped onion and shredded cheese on top -- my wife likes hers with low-fat sour cream. Serve over white or brown rice if you like - but this well-rounded dish is hearty enough to enjoy on its own. This hot pocket of oozing cheesy goodness is a warm welcome on a wintry day. You know how this Chef likes pita bread. Just see my Pita Pizza recipe. I've recently found whole wheat pitas on sale at 99c Only Stores and blocks of Colby cheese. And throw in my wife's tuna salad recipe and you have a great combination of a Pita Tuna Melt. Pita bread grills quickly and it's thinness makes quick work melting sliced cheese. 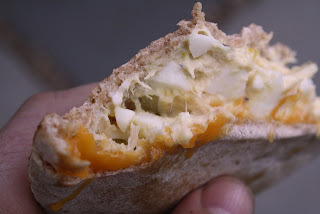 Toasted whole wheat pita is more flavorful than normal plain pita, and holds-up stuffed -- no tuna salad squeezing out of all sides like regular toasted bread. I've kept Pita Bread in the refrigerator for 3 weeks at a time, and they take-up very little room . A quick toasting softens them up. So next time you have a yearning for a tuna salad, give the Chef's Pita Tuna Melt a try. Make your favorite tuna salad recipe or use my wife's, just click here to view (maybe leave out the green olives?). 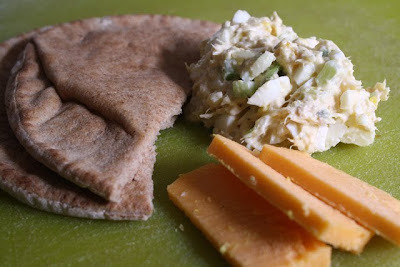 On a stove top grill or pan, over medium heat cook pita stuffed with cheese and tuna salad. Lightly brown on both sides of pita bread until cheese is melted. From the hallowed historic halls of Princeton University to tree-lined dappled sidewalks of Wellesly College, and esteemed lecture rooms from Harvard on the east coast to Stanford on the west coast, The 99 Cent Chef's blog has been somewhere on campus, according to my blog visitor tracking service Sitemeter. 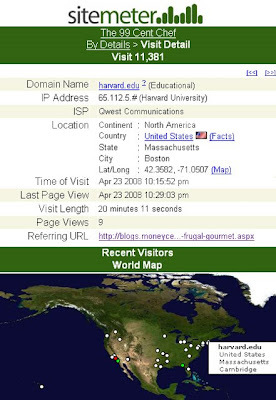 At least once a month an Ivy League domain name pops-up after a visit to the Chef's food blog. Is tuition so expensive that graduate students need food budget tightening ideas? Maybe The 99 Cent Chef blog is a footnote in a Yale business major's term paper; or perhaps a Stanford economics professor is adding a bit of lecture hall levity showing one of the Chef's humorous food themed videos. Is a homesick Wellesley College comely coed yearning for a home-styled recipe? In my "The 99 Cent Chef Goes To Jail" video I imagined a prison break (click here). And this month "The 99 Cent Chef Goes To Harvard". See what happens when the Chef's food blog breaches an erudite and scholarly east coast Ivy League citadel! Play it here. The video runs 1 minute, 43 seconds. 99 thanks to 99 Cent Player Jay Cotton. And congratulations too, as Jay is part of Pee-Wee Herman's live comeback show at Club Nokia in Los Angeles. Jay's musical styling are featured, as well as a new song he created for this thrilling stage show. Roasting and winter go together. Potatoes and carrots do too. They are cheap and nothing goes better with your favorite baked chicken recipe. 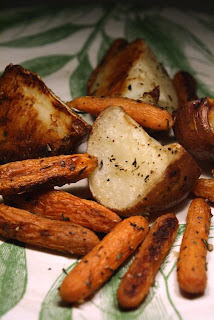 Just cut red or white potatoes into quarters and add a couple of handfuls of rough chopped carrots, drizzle with olive oil, and season with whatever dried herbs you have on hand. It only takes an hour of baking so put the pan of veggies in during the last hour of roasting. 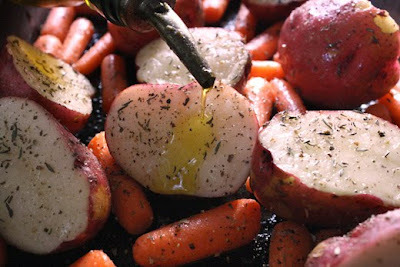 Other root veggies to roast include: whole garlic heads, turnips, onions, beets and parsnips. Roasting carmelizes and sweetens. Allow veggies to cool a little and the skin almost slides off. The Chef has a couple of roasted chicken recipes you can use: just click on Mint Chicken or Lemon Chicken and read all about it. 6 red or white potatoes - cut into 4 wedges each. OK to use regular russet potatoes. 2 cup of carrots - roughly chopped or pre-cut. 2 tbsp. dried herbs - including oregano, basil and thyme. 2 tbsp. olive oil or vegetable oil. Cut potatoes into quarters. Cut carrots into large sections or use pre-cut. Add cut veggies into a shallow roasting pan. Drizzle with olive or vegetable oil. Sprinkle dried or fresh herbs and season with salt and pepper. Roast uncovered for an hour at 350 degrees. You may want to try out a thick veggie at 45 minutes, depending on how hot your oven operates and how thin you cut the veggies. Turn veggies once after half an hour to brown on more than one side. If you are cooking your favorite roast bird, then add the veggies during the last hour of cooking. Like L.A. with its taco carts, Thailand has its own street food, and that is grilled Chicken Satay. The Chef has only been to Thailand through travel cooking shows like Anthony Bourdain's "No Reservations" and food websites that describe street vendor food, but he likes nothing better than pulling over to the curb to investigate what's cooking on the corner. And now the Chef brings his whisk to this corner of Southeast Asia. 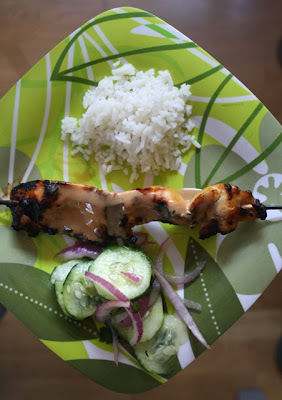 Skewered Grilled Chicken Satay may be a humble dish, but it seems to be a favorite on the party circuit - I had it recently at an opening for an exhibition of movie posters at the Motion Picture Academy in Beverly Hills. Not many street vendor dishes make it that far. For your own party, The Chef will show you how easy it is to make a platter of these tender and flavorful fowl fillets. 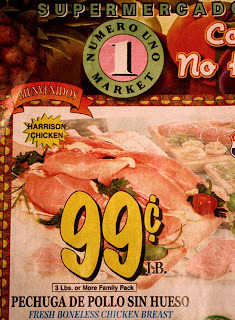 Chicken breast and skinned, boneless leg quarters are available for 99 cents or less at local Latin markets. There is little preparation to do; just slice into strips for skewering. Chicken breasts are simple to fillet -- just slide the knife blade along the middle breast bone and see how easily the flesh separates. Dark meat is the most foolproof -- it doesn't dry out as easily as white, and works best for a party where the cooked skewer satay may set out awhile. 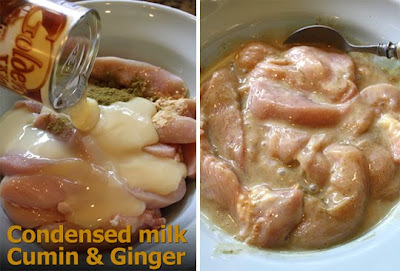 The chicken strips must then be marinated in a mixture of condensed milk, powdered ginger and cumin. Without bones or skin, the chicken skewers cook in 5 minutes, so you can leave the chicken marinating until the last minute for a quick grill or broil. If you are cooking ahead of time, dark meat is better; white meat tends to dry out. Either way, set aside some coconut cream for basting, to help keep cooked chicken moist while it stays covered and warm in the stove. 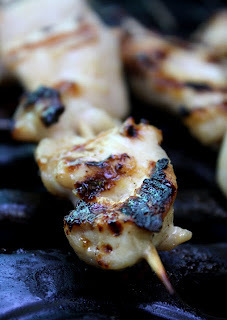 But there is nothing better than chicken satay hot off the grill ! To make a tasty Thai-style dipping sauce, mix peanut butter into heated coconut milk or coconut cream. This dish pairs perfectly with my Thai Cucumber Salad and Coconut Rice. Just click on the names to see my recipes. 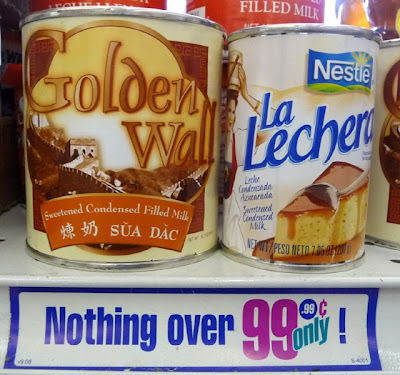 1 can (about 11 ounces) of condensed milk - OK to substitute 13oz. can of coconut cream or milk. Reserve a tablespoon for Peanut Dipping Sauce. 2 tbsp. peanut butter - I used a cheap smooth type. 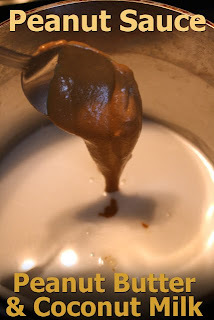 The dipping sauce is made by mixing coconut cream, condensed milk and peanut butter together in a saute pot. Heat and mix until blended, about 5 minutes. Set aside until serving time. Serve warm or at room temperature. Soak bamboo skewers in water. In a large bowl add condensed milk (or coconut milk) and mix in cumin and ginger. Reserve 1/4 cup of marinade for basting when grilling. On a cutting board slice chicken into strips or cubes. If you are using whole chicken breast it is easy to slice along middle bone/cartilage to remove large fillets to cut into strips. Dark meat thighs take a bit more work; the meat does not seperate from the bone as easily, but it is the cheapest way to go. I do find 99 cent per pound boneless chicken on sale at my local Latin market once a month. 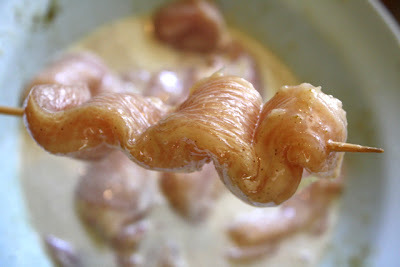 Add sliced or cubed cut chicken to condensed milk bowl. Allow to marinate an hour or more covered in the refrigerator. Heat your grill or broiler oven. Thread chicken pieces onto bamboo skewers. This is messy, so assemble skewers on a large platter. Grill or broil for 2 -3 minutes each side for white meat; dark meat may need an extra minute more. Use extra marinade or coconut milk for basting during grilling. Because the meat has no bone, it cooks fast. It is easy to overcook so keep an eye on it. Serve with Peanut Dipping Sauce on the side or in a shallow dish.